In 1900 a steadfast and feisty young woman, Jocelyn Belle Royal, joins a mule drive to earn back her Kansas, Flint Hills farm lost to the bank. Entanglements over the mules, outlaws, women’s suffrage, and a disagreement over the governor’s mansion, test her mettle to the limit. Jocelyn can’t give up if ‘home’ will ever again be more than a few belongings tied in a shawl, all that she owns. Miss Royal's Mules is a nice mix of a good story with accurate historical events and details. The author's rendition of a mule's bray was spot on. (I could just hear Andy or Mickey, the two mules we worked when I was growing up.) --JIM HOY, Emporia State University English Professor, (retired) folklorist, author of Flint Hills Cowboys. Fans of Irene Bennett Brown's work will fall in love with Miss Royal's Mules. It is a delight, moving, heartbreaking, and utterly unputdownable.--CHRIS ENSS, New York Times Bestselling author, The Doctor Wore Petticoats and Hearts West. Life has thrown all sorts of tragedy and difficulties at Jocelyn Royal, but even though her options are dwindling and her simple goals in life seem well out of reach, she's still far from whipped. When her path crosses that of Whit Hanley, who is moving a herd of mules to his Kansas ranch a few days ride north, fate begins to steer her toward a future that she never could have imagined. Irene Bennett Brown, originally a Kansas native, has written a poignant, engaging, and well-paced story that I highly recommend to anyone who enjoys a good frontier novel presented from a woman's unique point of view. I admire her writing style, which is both clever and charmingly colloquial. Her knowledge of every-day Kansas life and history at the turn of the century is admirable, and her depiction of the people, landscape and unique beauty of her home state contributes to the strength and authenticity of her story. 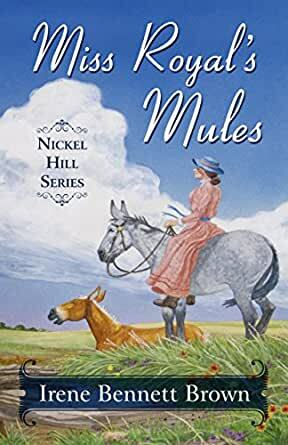 Miss Royal's Mules is the first in Irene Bennett Brown's Nickel Hill Series, and I look forward to following the ongoing saga of the poignant, strong-willed, and adventurous life of Miss Jocelyn Royal, an admirer of mules. Miss Royal’s Mules is part trail-drive western (mules in this case), part romance, part mystery and always entertaining as young Jocelyn Royal, verging on spinsterhood at the ripe old age of 24, tries to overcome economic hardship only to face another more dangerous set of adversities. Hoping to earn enough money to reclaim her repossessed farm, Jocelyn signs on with Whit Hanley to help him drive a herd of mules to Skiddy, Kansas, a few days away, where they can pasture on Hanley’s place until time to go to auction. Hanley and eventually his other hand, Sam Birdwhistle, abandon Jocelyn, leaving her to manage the mules and fend for herself against some sordid characters from Hanley’s past. Her Kansas neighbors and Pete, a cowboy from a neighboring county who had known Jocey as a girl and is enamored with her as a woman, rally to Jocelyn’s side and help her face the challenges before her. The novel is evocative of 1900 Kansas and how neighborliness helped everyone deal with the trials and loneliness of living in isolation. Miss Royal's Mules represents a tribute to the Kansas landscape and its fine people by Kansas native and Spur Award-winning novelist Irene Bennett Brown. Shades of Calamity Jane! Jocelyn Royal is a muleskinner! Well, not really. Jocelyn is a young woman adrift on her own in Kansas, back in the day when mules were common and had many uses. Her family dead, including her beloved but difficult grandmother, and the farm seized by the bank, Jocelyn has to scramble to survive. But she happens to meet Whit Hanley, who has a herd of mules to drive to his deserted ranch near Skiddy, Kansas. Trail boss Sam Birdwhistle, a black man, needs another hand. Whit at first refuses to consider a woman but reluctantly hires Jocelyn. Her duties are to cook, but she'll end up driving the mules too. If Whit has misgivings, so does Jocey, setting off with a man she doesn't know at the orders of another stranger who might well be crook or con man. The drive is uneventful, even boring, except when an old woman with a shotgun threatens to shoot the mules if they set foot on her property. The ranch has been vacant so long that the house is filthy and over-run with critters; the corrals are a shamble, and the pastures neglected. Jocey and Sam care for the mules and restore the ranch to working order, but Whit does not appear as he promised. Jocey's doubts about his honesty rise up to torment her, even more so when Sam announces he must return to his family. Jocey is a woman alone on a remote ranch, and all the perils—and some of the pleasures—of life in the American West beset her. There is romance—by coincidence she meets up with Pete, a cowboy she'd known as a child—and there are good and kind neighbors who watch over her. But she is attacked twice by outlaws bent on killing Whit, who once rode with them. On a sentimental trip back to her family farm in Missouri, a fierce prairie storm traps her, with her two favorite mules, in a falling-down barn. Jocey perseveres, tending the mules and the farm and living life as she believes is honorable and right. Whit does return, midway through the book, and Jocey accompanies him to Topeka to sell the mule herd and visit his mother and stepfather who, it turns out, live in a large and grand home but are fighting having it taken over for the governor's mansion. Francina, Whit's mother, is an active suffragette, and Jocey finds herself promising to come back for a big demonstration. Whit goes off to buy another herd of mules, and Jocey returns to the ranch. From that point on, the story gets tangled, and it would be a spoiler to reveal events. There is conflict, of course, but if there is such a thing, it's gentle conflict. There is no ongoing suspense but, instead, a comforting sense that it will all work out—and mostly it does. Jocey and Pete, her childhood friend, are perhaps the most chaste lovers in fiction today, indulging in only a few kisses as they plan ahead for marriage. The strongest oath Jocey ever utters is, "Oh, Hannah!" It is optimistic fiction, a novel that holds out the promise of placid days and happy-ever-after endings. A prolific novelist, Irene Bennett Brown's list of titles includes Before the Lark, a young-adult title that won a Spur Award from Western Writers of America and other significant recognition. In the first book, readers meet Jocey as a twelve-year-old farm girl who hides from the world because of her cleft palate. Miss Royal's Mules is an adult sequel, with Jocey now twenty-four. Her mouth has been surgically repaired, and Jocey has learned not to hide from the world. But this gentle fiction still reads like a y/a title. Publishers are calling books like this "up lit" and claiming in this time of political upheaval, terrorism, and tragedy in our country readers are turning away from "thriller" plots and looking for optimistic stories that are life-affirming. Kindness is at the core of this empathetic literature, and if any fictional heroine is kind and caring, it is Jocey Royal. She is kind to neighbors, strangers, and mules alike, though she fights like a demon when an outlaw attacks her. Sometimes today's fictional heroines seem to lack emotional depth, Jocey, on the other hand, feels things deeply, from her love for Pete and sympathy for the suffragists to her deep affection for the mules. One more element makes this affirmative literature—its rural setting. Americans cling to a strong belief in the wholesomeness or purity of a life lived close to the soil. Collectively, a century after the fact, we bemoan the increasing urbanization of our society which, we seem to believe, brought with it an unhealthy sophistication. That mindset is one thing that helps western American literature survive long after the frontier closed. And Jocelyn and Pete are people close to the earth. If you're looking for a good, old-fashioned love story of the frontier, I recommend Miss Royal's Mules.